Objective: Use the power-take-off (PTO) safely. Review the information below on PTOs, the hazards they present, and safe practices. Demonstrate how to hook up and unhook a PTO properly. Wear close-fitting clothing to reinforce the idea that loose clothing is dangerous. Supervise workers carefully as they practice hooking up and unhooking a PTO. Discuss the importance of keeping protective shields in place. Ask workers for examples of possible incidents and preventive measures that should be taken. Note: Wear close-fitting clothing. Have workers wear close-fitting clothing for this session. Most power shafts can be extended from the power source to another piece of equipment. This connection is called a power-take-off (PTO). The power source is whatever the PTO is connected to—a tractor, an all-terrain vehicle (ATV), lawnmower, or other equipment. Power shafts are usually constructed with a square shaft inserted into a housing or casing. It is important that at least 5½ inches of the sliding shaft remain in the housing when the power shaft is connected to the power source. This reduces the possibility of the shafts separating while the equipment is in motion. 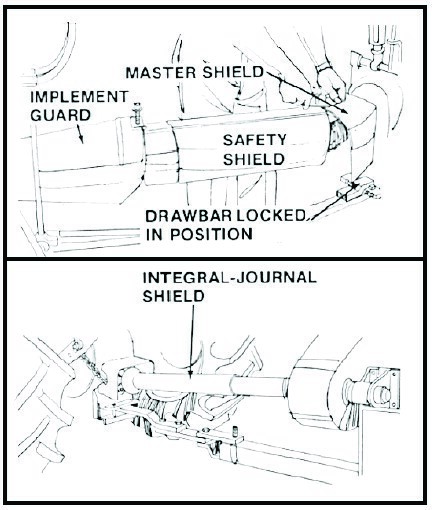 If the shaft splits, the portion of the shaft connected to the power source is free to whirl at high speeds, endangering the worker and equipment. People cannot react fast enough to pull away from a spinning shaft, and most clothing is strong enough to pull a person into the spinning shaft. Very serious injury and frequently death is the end result of these incidents. Before you start the power source, be sure the PTO is disengaged. If the PTO is already engaged when you start the power source, the equipment powered by the PTO will begin to operate. Use extreme caution when operating equipment with a separable PTO shaft. Never hook 540-rpm (revolutions per minute) equipment to a 1,000-rpm PTO or vice versa. If the shaft does separate, disengage the PTO immediately and stop the power unit. Keep safety shields securely fastened on the equipment. Periodic inspections and maintenance of the shields/guards may be necessary. Safe operation of the PTO is not possible without these shields in place. A sudden slip or fall could throw a worker directly onto the unshielded rotation shaft. Also, those who are unfamiliar with the equipment may not recognize the danger of the power shaft. Wear snug-fitting clothes when working around power shafts. Loose clothing can catch in or be wrapped around the power shaft. Do not step over an operating PTO. A sudden slip or a loose shoestring could cause the worker to become entangled in the PTO shaft. Long hair may also become entangled in a PTO shaft. Hair should be pulled back out of the way and secured. Also avoid any type of jewelry that could become entangled, causing dismemberment or bodily injury. Universal joints where clothing can get caught. Shielding covers most of the spinning shaft and universal joint. Keep all PTO guards and shields in place, even when the PTO is not operating. Always disconnect the PTO when not in use. Never engage the PTO while the machine engine is shut off. Keep hands, feet, clothing, and long hair away from the PTO. Never operate PTO shafts at extreme angles. Be sure that the PTO spinner shields rotate freely at all times. Always disengage all power and shut off equipment before servicing.